The pipe rack modules for the Bahrain LNG import terminal project. Ahmed Mansoor Al Aali’s structural and mechanical division is gaining a foothold in a niche market and winning global recognition, thanks to its engineering prowess. Bahrain-based engineering and contracting major Ahmed Mansoor Al Aali Group says its structural and mechanical division (AMD-SMD) has started delivery of the pipe rack modules (PRM) for the Bahrain LNG (BLNG) import terminal project. Under a subcontract from GS Engineering & Construction, the main contractor on the project, AMA-SMD is carrying out two packages for the project. The specialist engineering firm is responsible for the design, manufacturing, supply and transportation of 12 fully-assembled trestle modules and the topside jetty structure which is being shipped offshore for installation on the BLNG jetty. The PRM modules are up to 11.5-m wide and 24-m long weighing approximately 80-150 tonnes each. They are manufactured and fully modularised in the company’s technologically advanced facility, which is one of the largest of its kind in the GCC. 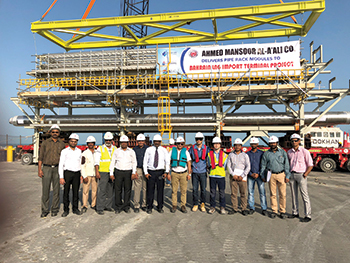 “We are undertaking fully modularised assembly, which includes the steelwork, pressure vessels, cryogenic piping, electricals, instrumentation, cold and hot insulation, fireproofing, all completed at our factory prior to shipping the large modules, all ready for installation at site,” Haresh Patel, the general manager of AMA-SMD, tells Gulf Construction. The estimated $990-million Bahrain LNG terminal will have a capacity of 800 million cu ft per day when it is completed in 2019. It will comprise a floating storage unit (FSU), an offshore LNG receiving jetty and breakwater, an adjacent regasification platform, a subsea gas pipeline from the platform to the shore, an onshore gas pipeline and gas receiving facility, and an onshore nitrogen production facility. AMD-SMD was established in 1990 as an integral division of the AMA Group which has completed more than 63 years as one of Bahrain’s leading integrated contracting, trading and manufacturing conglomerates. AMA-SMD has in the past decades left a strong imprint on the industrial sector in the region, supplying crucial fabrications to most of the aluminium smelters in the region including Alba, Emirates Aluminium (Emal) of Abu Dhabi and Dubai Aluminium (Dubal) of Dubai, and Sohar Aluminium, Oman, as well as abroad, and has now diversified to cater to offshore and onshore energy projects with supply and installations of fabricated equipment and modules. The division, which is a premium fabricator in the GCC, has one of the largest state-of-the-art fabrication and machining facilities of its kind in the Middle East. Its fabrication facilities are spread over 150,000 sq m in Bahrain with more than 40,000 sq m of covered workshop areas including 10 separate specialist workshops, fabrication shops and enclosed surface treatment facility and covered paint shop. It is acknowledged as one of the best in the Middle East by virtue of its state-of-the-art equipment including advanced computerised numerical control (CNC) machines that are capable of steel processing of 6 m wide and 20-m-long plates, up to 100-mm-thick cold rolling, 150-mm-thick drilling, advanced fabrication, welding, testing and handling capabilities.